Environmental Defence issued what they consider a study, and it was treated as news (Globe, Star). Your Home Electricity Bill: A Study on the Costs in Ontario includes some pedestrian costing estimation by a consultant, and regurgitates the spin from past reports that we had felt slain multiple times. The costing breaks down a bill for $137 which it claims is “based on 800kWh/Month” – which I calculate as working out to 17.25 cents/kWh. 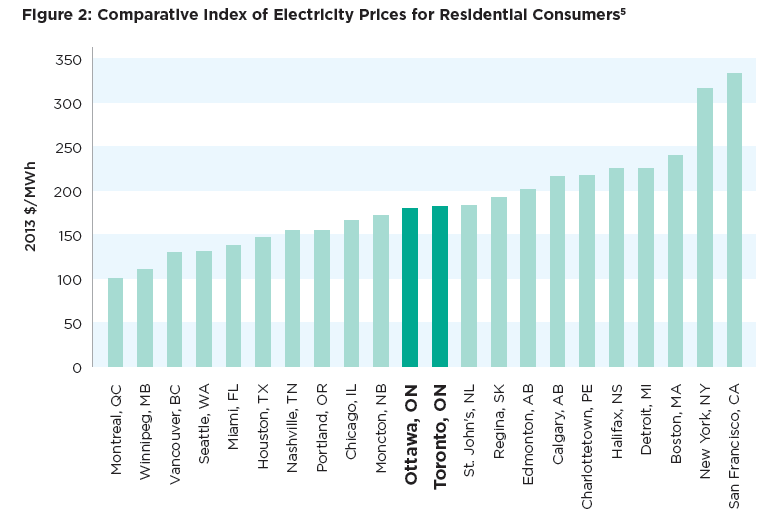 The report also cites a Hydro Quebec study to demonstrate how Toronto and Ottawa, collectively known as Ontario (prices are actually higher in the rest of Ontario than these cities). One problem is the HQ data being graphed is in base units, with Montreal set to 100, as the base: Montreal’s $68.66/month (1000kWh residential demand) is the index, making Toronto’s $124.75 182 on the index (because it’s 82% higher). This E.D. publication has Toronto rates at both 12.465 cents/kWh and 17.25 cents/kWh. An overview of net metering issues – with a possible model resolving some of them. Great article out of Germany: In Ontario it’s the cost of a Tim’s. In Germany it’s a scoop of ice cream. Three days before Ontarians headed to the polls, the Star brazenly provided Jürgen Trittin, formerly Germany’s Federal Minister of the Environment, Nature Conservation and Nuclear Safety 91998-2005), editorial space to intervene in Ontario’s election. Tritten’s lecture ended with “Ontario is on the right path. Now it must stay the course.” According to Der Speigel, that course involves politicians enriching allies: “Few people in the hinterlands are familiar with the name Aloys Wobben, but the founder of the wind power company Enercon is now a multibillionaire and one of Germany’s richest people. Thanks to former Environment Minister Jürgen Trittin, companies that got their start in garages were able to earn millions upon millions during the years when Germany was run by a Social Democratic Party (SPD) and Green Party coalition government…..” . Germany’s experience indicate they understood that increased contributions from wind must displace baseload (constant output) sources…. Germany, having found wind production was primarily driving exports, is now finding the same limitations are true of of the solar capacity which has seen enormous growth since wind output started dropping. From Spiegel Online, this article has been Google translated, so it may not be 100% accurate. I’ve tried to adjust the grammar where I could. You will get the general idea though. If anyone can do a better translation for me, please let me know and I’ll make the corrections. Funny how even with the rough translation, this sounds EXACTLY like Ontario. Now we know what those delivery fees, etc. on our electric bill REALLY are. Read on…. Expensive defense projects, agricultural subsidies: all are nothing compared to the cost of the energy transition, because the state guarantees investors a real windfall. In normal business life such deals are banned and for good reason. Curry’s commentary on Southern Company idling coal plants is also very important – and all ties into my Cold Air Currents post yesterday on bioenergy and CCS. Smart meters for all on the electricity side – on the gas side prices go up steeply in April because of expense in, primarily, February and early March. People will be mad at their gas utility, but those utilities don’t make money on the commodity. Perhaps anger should be turned on electricity sector decisions, and particularly coupling the early closure of coal-fired generation with heavy January exporting of gas-fired generation. My initial summary of February figures for Ontario’s Electricity sector began: “February was a disaster for Ontario’s electricity consumers – but not nearly as bad as it will be for Ontario’s natural gas consumers.” I should have noted I was referring only to large industrial, class A, electricity consumers. OTTAWA – The harsh reality of this winter’s exceptionally cold weather is catching up to millions of natural-gas users in central Canada. The natural-gas company Enbridge has applied to Ontario regulators for a nearly 40 per cent hike in the energy rates it charges customers, just one month after predicting that its massive storage capacity should mute any price increase. But it has been so cold, for such an extended period, that the utility says it was forced to buy more natural gas – at a much higher cost – than expected. “For a customer that does burn 3,000 cubic metres of gas a year, the increase for them is going to be in the order of $400,” said Enbridge energy supply and policy director Jamie LeBlanc. Normally, such a household would typically pay roughly $1,000 annually for natural gas. Kill the GEA and send the OLP up the Lower Mattagami! -resource fees have tripled for OPG. The OLP must think OPG is a mining company. (March 12, 2014) Ontario Power Generation (OPG) on March 7, 2014, released its results for the year ended December 31, 2013, which claims they eked out an after tax profit of $135 million on gross revenue of $4.9 billion. Good article – from a different perspective than I’ve looked at the issue. Exporting at low prices (which hasn’t been much of an issue thus far in 2014) is only a symptom of a problem. Better something than nothing – but best not to be purchasing, at high cost, supply that can’t be consumed in Ontario, but only dumped on export markets at lower cost. The Ontario NDP recently claimed that Ontario subsidizes exports of electricity to New York and Michigan. The NDP even claims that the subsidization of electricity exports costs Ontario $1-billion a year. Fortunately for Ontario ratepayers, this is simply not true. Those who claim that Ontario subsidizes electricity exports fail to understand both basic economics and how the Ontario electricity sector actually works.